Like serving summer on a stick. 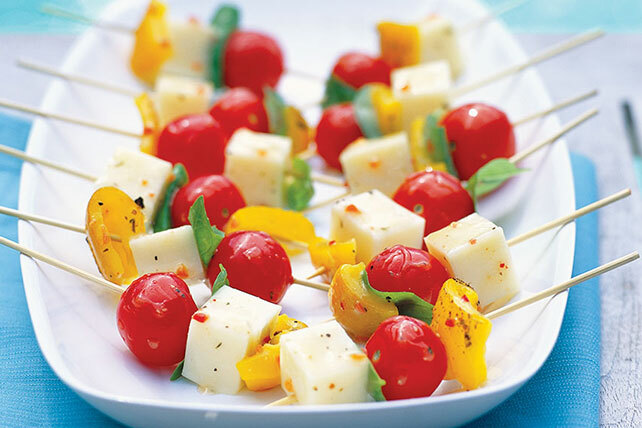 Cheese, roasted peppers and fresh tomatoes and basil line up to celebrate on your patio. Fast and delicious, too. Thread all ingredients except dressing onto 16 small wooden skewers or toothpicks. Place in shallow dish. Add dressing; turn skewers to evenly coat ingredients with dressing. Let stand at room temperature 20 min. to marinate, turning occasionally. Remove skewers from marinade just before serving; discard marinade. Substitute 2 pkg. (8 oz. each) KRAFT Monterey Jack Cheese for the 16-oz. pkg. of mozzarella. Heat broiler. Place whole bell peppers or large chile peppers on foil-covered baking sheet. Broil, 4 inches from heat, 7 to 10 min. or until peppers are evenly blackened, turning occasionally. Place in paper bag; close bag. Let stand 20 min. or until peppers are cooled. Remove peppers from bag. Peel away blackened skins with small knife; discard skins. Cut peppers lengthwise in half; remove and discard seeds. Use roasted peppers as directed in recipe.